Israel Folau has 48 hours to request a hearing or be sacked by Rugby Australia (RA) over his controversial social media posts, while Wallabies coach Michael Cheika dismissed the full-back's Rugby World Cup hopes. 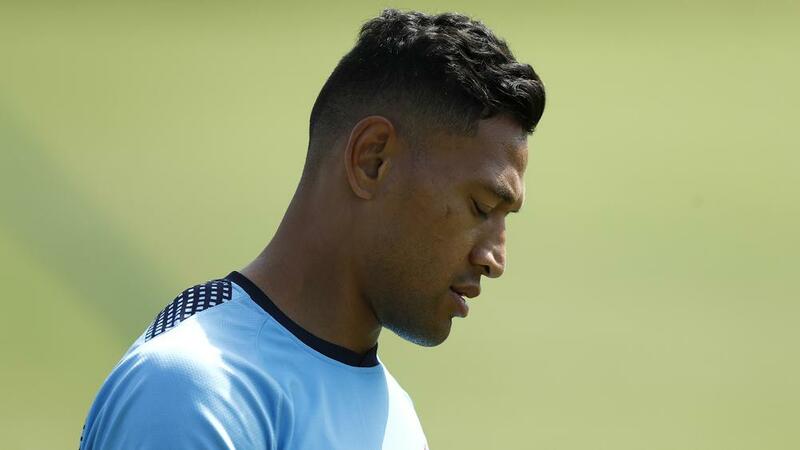 RA on Monday issued Folau with a breach notice after the devout Christian sparked outrage with his online activity last week, delivering another anti-homosexual post. Folau – who avoided punishment last year after stating homosexuals should go to "hell" unless they "repent their sins and turn to God" – also caused a stir with his stance on the Tasmanian Parliament passing a legislation to make gender optional on birth certificates and allow people 16 years and older to legally change gender without parental consent. RA chief executive Raelene Castle said the 30-year-old has been charged with a "high-level" code of conduct breach and can either accept the finding and the consequent termination of his contract or ask for a hearing. Earlier in the day, Cheika all but ruled out Folau's chances of representing Australia at the World Cup in Japan, starting in September. "As it stands right now … you wouldn't be able to," Cheika told reporters when asked whether he would be able to select Folau, who has also been stood down by Super Rugby team the Waratahs. "No I didn't [think the issue would return] to be honest. We had discussion after the last time and made it pretty clear about his right to believe and our support in that — if that's what he wants — to be part of the team," Cheika said. "But getting out in that disrespectful manner publicly is not what our team is about. When you play in the gold jersey we represent everyone in Australia, everyone. "Everyone that is out there supporting us, we don't pick and choose. "We want everyone on that wagon with us to the World Cup for example, or in a Bledisloe Cup, we want everyone there fighting with us and standing with us. "Because often those games are difficult and we need everyone with us and that's what you do, you represent everyone when you get that opportunity to put that jersey on. "Whether it's a player playing in that number somewhere in a grade, somewhere around Australia, or the people who could never play there, who didn't have the ability or the chance. "People who just love the game, that volunteer for the game at all levels, club-level participation, at junior grades, all of that stuff. "I know that sounds a little bit romantic in itself but it's the truth of the matter. I know from having never played for Australia, so I look up to the guys that play for Australia with that same eye to say, 'You represent me every time you go out there.'"